Dubai is well known for its extravagant and luxurious hotels and resorts and each venue tries to outdo the other with new concepts and unique ideas. However, no resort in Dubai has been able to outshine the Madinat Jumeirah Arabian Resort which is considered by many to be the most luxurious resort in the Emirates. Developed on 40 hectares of beach front property, Madinat Jumeirah aesthetically resembles a traditional Emirati town along the Dubai Creek. The resort is the largest of its kind in Dubai and has mulitple gardens, landscapes and artificial rivers. The one kilometer beach front resort has numerous attractions including two boutique hotels and 29 beautiful summer houses that line the creek. A large number of restaurants, cafes and shops are located with in the venue and offer guests an unparalleled luxury experience in Dubai. 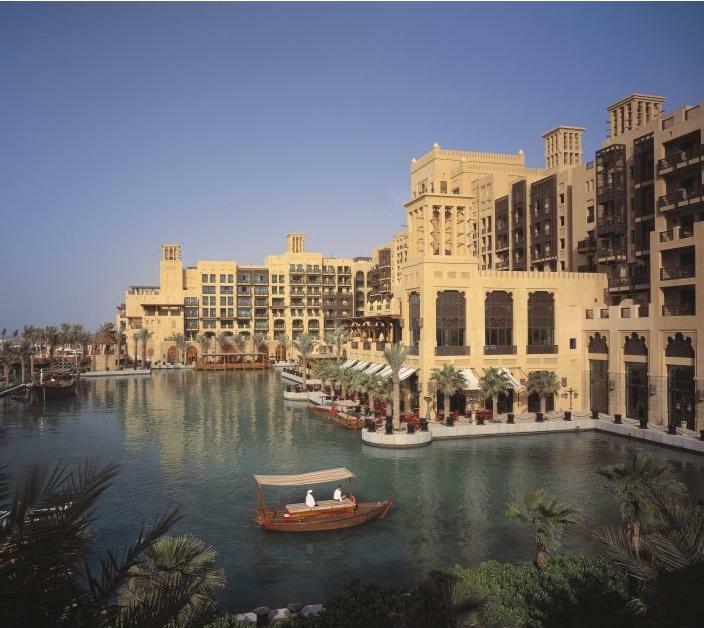 The Madinat Jumeirah is owned and operated by hotel and resort group Jumeirah. The large resort was developed by Mirage Mille who worked with Creative Kingdom and DSA Architects to come up with the concept and designs of the massive beach front resort. The paper work for the project was started in 2000, and by 2003 the first phase of the project was completed. Over the next year, the project was completed as waterways, abras, wind towers and a souk were added and the grand opening took place in 2004. Since the resort contains different types of venues. Each restaurant, bar and night club has its own timings and it is best to check the resort directory for individual schedules. Furthermore, the hotel remains open for 24 hours. The nearest metro stop is the Mall of Emirates Metro Station. From there, commuters can make their way to northeast and make a right toward Umm Suqeim Road. Once they reach Umm Suqeim road, they need to make a left and then another left onto Al Sufouh Road. The resort will be on the right. View Map. The resort has its own own bus stop named Madinat Jumeira. Bus routes number 8 and 88 will drop commuters off in front of the venue. View Map.